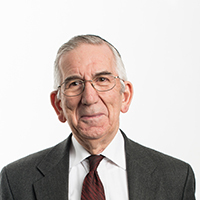 Ian Smith has been a member of the academic staff since 1962 and currently holds the position of Professor of Applied Thermodynamics in the Department of Mechanical Engineering. He received the degree of BSc in Mechanical Engineering at the University of Cape Town, following which he obtained a diploma in Gas Turbine Technology at Imperial College, London and a PhD from the University of London. Prior to coming to CUL, he spent three years in the aircraft gas turbine industry. Since his appointment at City, he pioneered the first MSc course in the Department of Mechanical Engineering and initiated research in the recovery of power from low grade heat sources, which has been his main field of interest and in which he is an acknowledged expert. Resulting from this, he formed the Centre for Positive Displacement Compressor Technology in 1995, together with Professor Nikola Stosic, and this is now recognised as an international centre of excellence in twin screw machines. As a result of his and Nikola Stosic’s work in this area, Heliex Power Ltd, a spin out company was formed to commercialise their work in 2009. Ian has over 130 publications, including three monographs and eight patents. He has also received 13 professional awards and prizes, including the Institution of Marine Engineers Silver Medal and the highly prestigious James Clayton Prize from the Institution of Mechanical Engineers. Smith, I.K., Branover, H. and Yakhot, A. (1982). Performance studies on Two-phase low temperature liquid metal MHD Systems. Smith, I.K. (1978). The use of the Lee and Kesler equations of state for the estimation of common refrigerant properties. Proc NPL Conf: Chemical Thermodynamic Data on Fluids & Fluid Mixtures. NPL Teddington Teddington. Stosic, N., Smith, I. and Mujic, E. (2011). Steam as the working fluid for power recovery from exhaust gases by means of screw expanders. Proceedings of the IMechE, Part E: J. of Process Mechanical Engineering, Special Issue, 225(2), pp. 117–126. Smith, I.K., Stosic, N. and Aldis, C. (1996). Development of Trilateral Flash Cycle System: Part 3. The Design of High Efficiency Two-Phase Screw Expanders. IMechE Journal for Power and Energy, 210, pp. 75–93. Smith, I.K. and Pitanga Marques da Silva, R. (1994). Development of Trilateral Flash Cycle System: Part 2. Increasing Power Output with Working Fluid Mixtures. IMechE Journal for Power and Energy, 208, pp. 135–144. Smith, I.K. (1993). Development of Trilateral Flash Cycle System: Part 1. Fundamental Considerations. IMechE Journal for Power and Energy, 207, pp. 179–194. Smith, I.K. (1992). Matching and Work Ratio in Elementary Thermal Power Plant Theory. Proceedings of the Institution of Mechanical Engineers, Part A: Journal of Power and Energy, 206(4), pp. 257–262. doi:10.1243/pime_proc_1992_206_042_02 . Smith, I.K. (1981). The choice of working fluids for power recovery from waste heat streams. Trans IMarE (C), 93(C70). Smith, I.K. (1969). The Supersonic Aerothermopressor. Proceedings of the Institution of Mechanical Engineers, 184(1), pp. 121–132. doi:10.1243/pime_proc_1969_184_014_02 . Smith, I.K. (2016). Total Flow and other Systems involving Two-Phase Expansion. In DiPippo, R. (Ed. ), Geothermal Power Generation - Developments and Innovations. (pp. 321–352). UK: Woodhead publishing series in energy. ISBN 978-0-08-100337-4. Smith, I.K. (1994). Power Plant Cycles and Processes. In Crook, A.W. (Ed. ), Profiting from Low Grade Heat Thermodynamic Cycles for Low-Temperature Heat Sources. The Watt Committee on Energy, Report No 26. (pp. 32–61). London, UK: The Institution of Electrical Engineers. ISBN 978-0-85296-835-2. Smith, I.K. (1994). Working Fluid Selection for Power Generation. In Crook, A.W. (Ed. ), Profiting from Low Grade Heat Thermodynamic Cycles for Low-Temperature Heat Sources. The Watt Committee on Energy, Report No 26. (pp. 67–74). London, UK: The Institution of Electrical Engineers. ISBN 978-0-85296-835-2. Smith, I.K. (1994). Existing Installations. In Crook, A.W. (Ed. ), Profiting from Low Grade Heat Thermodynamic Cycles for Low-Temperature Heat Sources. The Watt Committee on Energy, Report No 26. (pp. 90–98). London, UK: The Institution of Electrical Engineers. ISBN 978-0-85296-835-2. Smith, I.K., Stosic, N. and Read, M. (2013). Optimisation of Screw Expanders for Power Recovery from Low Grade Heat Sources. ASME 2013 International Mechanical Engineering Congress & Exposition IMECE2013 13-21 November, San Diego, USA. Smith, I.K., Dhunput, A. and Kovacevic, A. (2012). Use of New Generation Instruments in Measurement of New Steam Expander. Purdue Compressor Technology Conference July, Lafayette, IN. Smith, I.K., Stosic, N. and Kovacevic, A. (2011). Numerical and experimental research in heat transfer to screw compressor rotors. the ASME/JSME 2011 8th Thermal Engineering Joint Conference AJTEC2011 13-17 July, Honolulu, Hawaii, USA. Stosic, N., Smith, I.K. and Kovacevic, A. (2011). Numerical and experimental research in heat transfer to screw compressor rotors. Kethidi, M., Kovacevic, A., Stosic, N. and Smith, I.K. (2011). Evaluation of various turbulence models in predicting screw compressor flow processes by CFD. Smith, I.K., Stosic, N. and Kovacevic, A. (2010). Development of Water Lubruicated Compressor Expander for Fuel Cell Application. ASME 2010 International Mechanical Engineering Congress & Exposition IMECE2010-37437 12-18 November, Vancouver, British Columbia, Canada. Smith, I.K., Kovacevic, A., Stosic, N., Mujic, E. and Kethidi, M. (2010). Turbulence Capture in CFD for Screw Machines. Conference on Screw Type Machines VDI-Schraubenmachinen October, Dortmund, Germany. Smith, I.K., Kovacevic, A., Stosic, N. and Mujic, E. (2010). Advanced Design Environment for Screw Machines. 20th International Compressor Engineering Conference at Purdue July, Lafayette, IN, USA. Smith, I.K., Stosic, N., Kovacevic, A. and Mujic, E. (2010). Three Decades of Modern Practice in Screw Compressors. 20th International Compressor Engineering Conference at Purdue July, Lafayette, IN, USA. Smith, I.K., Stosic, N., Kovacevic, A. and Mujic, E. (2010). Extending the Role of Computational Fluid Dynamics in Screw Machines. 20th International Compressor Engineering Conference at Purdue July, Lafayette, IN, USA. Smith, I.K., Stosic, N., Kovacevic, A. and Mujic, E. (2010). Research in Water Lubricated Screw Compressors for Fuel Cell Aplication. FC Expo, Academic Forum March, Tokyo. Stosic, N., Smith, I.K., Kovacevic, A. and Mujic, E. (2010). Development of water lubricated comrpessor-expander for fuel cell application. Smith, I.K., Stosic, N., Mujic, E., Kovacevic, A. and Okezue, C. (2009). Overview of Methods used for the Analysis of Multiphase Flows in Positive Displacement Machines. International Conference on Compressors and Their Systems 7-9 September, London. Smith, I.K., Stosic, N., Kovacevic, A., Leyderman, A. and Delash, T. (2009). Rotor Retrofit for Better Screw Compressor Performance in Refrigeraion and Air Conditioning. International Conference on Compressors and Their Systems 7-9 September, London. Smith, I.K., Stosic, N., Kovacevic, A., Mujic, E. and Guerrato, D. (2009). Extending the Role of Computational Fluid Dynamics in Screw Machines. International Conference on Compressors and Their Systems 7-9 September, London. Smith, I.K., Kovacevic, A., Stosic, N. and Mujic, E. (2009). Numerical Modelling of Gas Pulsations in a Screw Compressor. International Conference on Compressors and Their Systems 7-9 September, London. Smith, I.K., Kovacevic, A. and Stosic, N. (2009). Steam as the Working Fluid for Power Recovery from Exhaust Gases by Means of Screw Expanders. International Conference on Compressors and Their Systems 7-9 September, London. Stosic, N. and Smith, I.K. (2009). Utilization of expansion work in transcritical CO2 heat pumps in combined heating and cooling. Smith, I.K. and Stosic, N. (2008). Utilization of Expansion Work in Transcritical CO2 Heat Pumps in Combined Heating and Cooling. 2008 ASME International Mechanical Engineering Congress and Exposition 31 Oct 2008 – 6 Nov 2008, Boston, Massachusetts, USA. Stosic, N., Kovacevic, A., Smith, I.K. and Mujic, E. (2008). An evaluation of encapsulated oil flooded screw compressor systems. Kovačević, A., Stošić, N. and Smith, I.K. (2006). Numerical simulation of combined screw compressor-expander machines for use in high pressure refrigeration systems. Kovacevic, A., Stosic, N., Mujic, E. and Smith, I.K. (2005). Design integration for screw compressors. Stošić, N. (2005). Identification of constraints in the optimal generation of screw compressor rotors by the pressure angle method. Stosic, N. (2005). Tool wear and its compensation in screw rotor manufacturing. Kovacevic, A., Stosic, N., Smith, I.K. and Mujic, E. (2004). Development of the management interface for screw compressor design tools. Stosic, N., Smith, I.K. and Kovacevic, A. (2003). Optimisation of screw compressors. Stosic, N., Smith, I.K., Kovacevic, A., PEP, and PEP, (2003). Improving refrigeration screw compressor performance with optimized rotors. Kovacevic, A., Stosic, N., Smith, I.K., PEP, and PEP, (2003). The application of CFD analysis to the design of bi-functional screw machines. Kovacevic, A., Stosic, N. and Smith, I.K. (2002). Three-dimensional modelling of solid fluid interaction as a design tool in screw compressors. Smith, I.K., Stosic, N., Kovacevic, A., IMECHE, and IMECHE, (2001). A feasibility study of throttle loss power recovery in large heat pumps with two stage compression. McCreath, P., Stosic, N., Smith, I.K., Kovacevic, A., IMECHE, and IMECHE, (2001). The design of efficient screw compressors for delivery of dry air. Stosic, N., Smith, I.K. and Kovacevic, A. (2000). Design of oil-less helical twin screw machines. Kovacevic, A., Stosic, N., Smith, I.K., ENGINEERS, I.M. and ENGINEERS, I.M. (1999). Development of CAD-CFD interface for screw compressor design. Smith, I.K., Stosic, N., Aldis, C.A., Kovacevic, A., ENGINEERS, I.M. and ENGINEERS, I.M. (1999). Twin screw two-phase expanders in large chiller units. Stosic, N., Smith, I.K. and Kovacevic, A. (1998). Some aspects of tool design for screw compressor rotor manufacturing. Stošić, N., Smith, I.K., Brasz, J.J. and Sishtla, V. (1998). The performance of a screw compressor with involute contact rotors in a low viscosity gas-liquid mixture environment. Smith, I.K., Stasiek, J., Ciofalo, M. and Collins, M.W. (1994). Experimental and analytical studies of fluid flow and heat transfer across corrugated-undulated heat exchanger surfaces. UK. Smith, I.K., Xu, Z.G. and Aldis, C.A. (1992). Local Void Fraction Measurement in Two-Phase Flow of Refrigerants by Optical Method. UK. Smith, I.K. (1992). Prospects of Two-Phase Expanders. Proc SRM Conf, Stockholm Sweden. Smith, I.K., Xu, Z.G. and Aldis, C.A. (1991). Local Void Fraction Measurement in Flow Channels of Irregular Shape. UK. Smith, I.K., Harrison, H.R. and Cox, M. (1990). A Preliminary Evaluation of the Groll Rotary Vane Compressor. USA. Smith, I.K. and Aldis, C.A. (1990). Lysholm Screw Expanders in place of Throttle Valves in Large Heat Pump and Refrigeration Systems. Sweden. Smith, I.K. (1989). The Trilateral Flash Cycle System for Power Recovery from Hot Dry Rock. UK. Smith, I.K. (1985). The Trilateral Wet Vapour Cycle System. Smith, I.K., Branover, H. and Yakhot, A. (1983). Development of a Low Temperature Liquid-metal MHD Small Scale Pilot Plant. Smith, I.K., Hirons, B. and Turtle, J. (1982). The conceptual design of a 4 MWe organic fluid power plant for a geothermal resource. Italy. Smith, I.K. (1981). The cost of power recovery from waste heat. Proc 3rd Int Conf on Future Energy Concepts. IEE, London. Smith, I.K., Musgrave, G., O'Kelly, D., Sherlock, J. and Wilson, J.J. (1981). Energy Recovery: A multidisciplinary approach and its ramifications related to industrial strategies. Read, M., Stosic, N. and Smith, I.K. (2014). Optimization of Screw Expanders for Power Recovery From Low-Grade Heat Sources. Energy Technology & Policy, 1(1), pp. 131–142. doi:10.1080/23317000.2014.969454 . Smith, I.K., Mujic, E., Kovacevic, A. and Stosic, N. (2011). Noise generation and suppression in twin screw compressors machines. Proceedings of the IMechE, Part E: J. of Process Mechanical, 225 (2)(Special Issue), pp. 127–148. doi:10.1177/1464419311403875 . Smith, I.K. and Stosic, N. (2011). Guest editorial. Proceedings of the Institution of Mechanical Engineers, Part E: Journal of Process Mechanical Engineering, 225(2), p. 81. doi:10.1177/0954408911408004 . Stosic, N., Smith, I., Kovacevic, A. and Mujic, E. (2011). Geometry of screw compressor rotors and their tools. Journal of Zhejiang University-SCIENCE A, Applied Physics & Engineering, 12(4), pp. 310–326. Smith, I.K., Stosic, N., Kovacevic, A. and Mujic, E. (2009). Influencia de la forma del puerto de descarga en las prestaciones del compresor de tornillo y en las pulsaciones del gas. Frío-calor y aire acondicionado pp. 14–23. Smith, I.K. and Stosic, N. (2008). Special isssue on compressors and their systems. Proceedings of the Institution of Mechanical Engineers, Part E: Journal of Process Mechanical Engineering, 222(4). Smith, I.K., Mujic, E., Kovacevic, A. and Stosic, N. (2008). The Influence of Port Shape on Gas Pulsations in a Screw Compressor Discharge Chamber. Journal of Process Mechanical Engineering, Part E, 222, pp. 211–223. Smith, I.K., Guerrato, D., Nouri, J.M., Arcoumanis, C. and Stosic, N. (2008). Flow Measurements in the Discharge Port of a Screw Compressor. Journal of Process Mechanical Engineering, Part E, 222, pp. 201–210. doi:10.1243/09544089JPME200 . Smith, I.K., Kovacevic, A., Mujic, E. and Stosic, N. (2007). CFD Integrated Design of Screw Compressors. Journal of Engineering Applications of CFM, 1 (2), pp. 96–108. Smith, I.K., Kovacevic, A. and Stosic, N. (2006). Numerical simulation of combined screw compressor-expander machines for use in high pressure refrigeration systems. Journal of Simulation Modelling Practice and Theory, 14(8), pp. 1143–1154. Smith, I.K., Alagic, S., Kovacevic, A. and Buljubasic, I. (2005). A Numerical Analysis of Heat Transfer and Fluid Flow in Rotary Regenerative Air Pre-Heaters. Strojniški Vestnik: Journal of Mechanical Engineering, 51(7-8), pp. 411–417. Kovacevic, A., Stosic, N. and Smith, I.K. (2004). A numerical study of fluid-solid interaction in screw compressors. International Journal of Computer Applications in Technology, 21(4), pp. 148–158. doi:10.1504/IJCAT.2004.006651 . Smith, I.K., Stosic, N. and Kovačević, A. (2004). Multifunctional Screw Machines. Mašinstvo Journal, Zenica, 8(1), pp. 3–16. Smith, I.K., Kovačević, A. and Stosic, N. (2004). A Numerical Study of Fluid – Solid Interaction in Screw Compressors. International Journal on Computer Application in Technology, 24(1), pp. 148–158. Smith, I.K., Stosic, N. and Kovačević, A. (2003). The Design of Efficient Air Screw Compressors. Mašinstvo Journal, Zenica, 7(1), pp. 12–26. Smith, I.K., Kovačević, A. and Stosic, N. (2003). Three Dimensional Numerical Analysis of Screw Compressor Performance. Journal of Computer Methods in Applied Mechanics and Engineering, 3(2), pp. 259–284. Smith, I.K., Stosic, N. and Kovačević, A. (2003). Optimisation of Screw Compressors. Applied Thermal Engineering, 23, pp. 1177–1195. Smith, I.K., Stosic, N., Kovačević, A. and Mc Creith, I. (2003). Proektirovanie effektivniih vintoviih kompressorov dlia podachi suhogo vazduha. Compressors and Pneumatics, 1, pp. 2–5. Smith, I.K., Madhav, K.V., Stosic, N. and Kovačević, A. (2003). Proektirovanie semeistva maslozapolneniih vintoviih kompressorov. Compressors and Pneumatics, 1, pp. 2–5. Smith, I.K., Stosic, N. and Kovačević, A. (2003). Opportunities for Innovation with Screw Compressors. Proceedings of IMechE, Journal of Process Mechanical Engineering, 217, pp. 157–170. Smith, I.K., Stosic, N. and Kovačević, N. (2003). Rotor Interference as a Criterion for Screw Compressors Design. Journal of Engineering Design, 14(2), pp. 209–220. Smith, I.K., Stosic, N. and Kovačević, A. (2002). Screw Compressor: A Strong Link in The Development Chain. Technical Gazette, Slavonski Brod, 9(3,4), pp. 41–46. Smith, I.K., Stosic, N. and Kovačević, A. (2001). Twin Screw Machines to replace Throttle Valve in Refrigeration Systems. Strojniški Vestnik: Journal of Mechanical Engineering, 4, p. 484. Smith, I.K., Stosic, N. and Kovačević, A. (2000). Design of Oil-Less Helical Twin Screw Machines. Mašinstvo Journal, Zenica, 3(4), pp. 171–180. Smith, I.K., Stosic, N., Kovačević, A. and Aldis, C.A. (1997). The Design of a Twin-screw Compressor Based on a New Rotor Profile. Journal of Engineering Design, 8(4), pp. 389–399. Smith, I.K., Stoisic, N., Kovačević, A. and Aldis, C.A. (1997). An Application of 'N' Rotors in an Oil Flooded Screw Compressor. 'Mašinstvo' Journal of Mechanical Engineering, Zenica, 1(1), pp. 3–11. Smith, I.K., Stosic, N., Kovačević, A. and Aldis, C.A. (1997). The Design of a Twin-screw Compressor Based on a New Rotor Profile. Mašinstvo Journal, Zenica, 1(1), pp. 1–9. Al-Hussaini, H. and Smith, I.K. (1995). Enhancing of solar still productivity using vacuum technology. Energy Conversion and Management, 36(11), pp. 1047–1051. doi:10.1016/0196-8904(95)00003-v .
Smith, I.K., Harrison, H.R. and Cox, M. (1992). A preliminary evaluation of the Groll rotary vane compressor. International Journal of Refrigeration, 15(2), pp. 69–73. doi:10.1016/0140-7007(92)90029-t .
Smith, I.K. (1991). Developments in Compression and Expansion. Proc Inst Refrig, 88. Smith, I.K. (1986). Power from low grade heat sources: The Kalina Cycle. CME, 33(1). Smith, I.K. and Martin, P.R. (1985). Power from low grade heat sources: Project SPHERE: an evaluation of the Trilateral Wet Vapour Cycle. CME, 32(1). Smith, I.K. (1982). Power recovery from low grade heat. Industrial Energy. Smith, I.K. and Tiefenbrunner, E.B. (1981). The measurement of organic fluid thermal properties. Tran IMechE Part C, 93(C71). Smith, I.K. and Abubaker, M. (1981). Heat exchanger design for organic fluid power plant. Tran IMarE (C), 93(C73). Smith, I.K., Musgrave, G., Kelly, O., Sherlock, J. and Wilson, S.S. (1980). The TIGER project: A proposal for utilising industrial waste heat. Journal of the Energy Institute, vLIII(416). Smith, I.K. and Garmendia, L.A. (1979). The effects of an electrostatic field and air stream on water spray droplet size. Transactions of the Institution of Chemical Engineers. Garmendia, L.A. and Smith, I.K. (1975). The effects of an electrostatic field and air stream on water jet break-up length. The Canadian Journal of Chemical Engineering, 53(6), pp. 606–610. doi:10.1002/cjce.5450530604 . Smith, I.K. (1975). The effects of an electrostatic field and air stream on water jet spray angle. Transactions of the Institution of Chemical Engineers, v57, 1975. Smith, I.K. (2005). 5. New Cycle for power recovery from low grade heat WO2005/031123 7th April 2005.